David Fiorazo is an author, associate pastor, media contributor, and radio personality. He has been involved in the broadcasting and entertainment industries for over thirty years, and in Christian ministry for over twenty five years. The truth is – silence never saved anybody. Rather than retreat and hide the light of Christ, we must stand and fight the good fight of faith, speak the truth in love and bear fruit that will last. If Christians remain silent, fewer people will be saved, society will collapse, and we will continue to be part of the problem. Today’s church seems more comfortable blending in with the world rather than being set apart from it, and our apathy is killing us! In the last hundred years in America, we have not only invited evil in, we often justify it. Rather than resist the sin that used to repulse us and cause us deep remorse, we have warmed up to it. 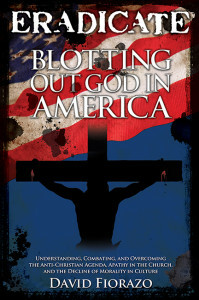 (From Life Sentence Publishing), is an information-packed work identifying two major problems causing the spiritual and moral decline in our country: the secular agendas to blot out God, and the complacency of Christians. HOW and WHY is this happening?